Dry air is always a discomfort to everyone, especially in winter. This is the reason why a whole house humidifier is the great option to add humidity to your atmosphere and prevent respiratory problems. 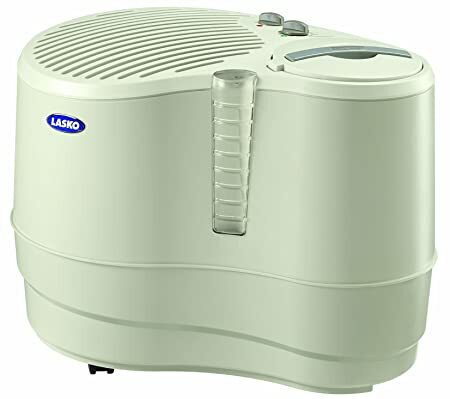 Among a great number of humidifiers available on today’s market, Lasko 1128 Evaporative Recirculating Humidifier, 9-Gallon gains high position in customer heart and belief thanks to numerous gorgeous features. Coming with modern technology, it pleases different types of customers in many aspects. For the excellent performance, the tool deserves to rank 4 out of 5 stars. If you are confused by different reliable brands, this article is for you. With the target of providing much humidity, Lasko 1128 is designed to be slightly bigger than other models in the same category. It weighs 20.4 pounds and 22 x 14 x 17 inches in dimensions, completely suitable for large working areas. One fact is that its white plastic body is not very sturdy. Therefore, be careful when using or lifting the humidifier. Users will easily know when to fulfill the water tank through a small window right on body of the humidifier. Besides, there are 2 available switch buttons on top of the machine. They allow the great ease of choosing on/off function and starting its operation. In addition to 2 useful handles, the humidifier also equips plastic wheels for easy carrying from rooms over rooms. Get it now and enjoy this fabulous feature. Lasko 1128 Evaporative Recirculating Humidifier is an ideal option for people who love the elegant design and high efficiency. Humidity efficiency is the first important element you had better put into your consideration when using this smart tool. The humidifier could disperse humidity in a large space of 3200 square feet and up to 9 gallons per day. There are 3 popular programs you could select from this machine, including low, medium and high levels. It is not too difficult if you intend humidifying in smaller space or a room only. In this case, let’s choose the lowest level and it promises to make you feel please. Then, move on the noise of its operation. The humidifier is not super quiet; however, it is acceptable with low settings. As a result, it could be effectively used in bed rooms in low humidity level. The high level of humidity is not appropriate in this case because it can make people awake at night. A great benefit of using the tool is that it delivers replaceable filter from Lasko stores. Then, it boosts the ease of using the humidifier in a comprehensive way. If you need any support from experts in operating the humidifier, read carefully its manual instruction. In order to strengthen the longevity of this humidifier, regularly cleaning its different components is an important task. It helps remove odors and bacteria on the humidifier surface. You shouldn’t use tap water to clean or fulfill the tank. This is because tap water contains minerals which may damage the filters. In short, Lasko 1128 Evaporative Recirculating Humidifier, 9-Gallon features the plenty of pretty characteristics for humidifying in large spaces. Using this smart tool means you are guaranteed by a well-known brand in humidifier industry. It is obvious that the tool offers an effective way to improve the general health of users by enhancing their respiratory system and removing bacteria.